Why do expats need VPN you might ask? The number one reason is to watch TV. Face it, you’re far from home, you’re working/playing hard and at the end of a long day all you want to do is watch your favorite shows from your home country and VPN is what enables you to do this. If you didn’t know, let me explain. Most streaming media found on the Internet is geo-restricted in some form. This means it can only be viewed, or viewed in full, when being accessed by a computer located in the same country. As mundane as this is there are also some more sobering reasons. Expats, citizens of one country living abroad, are especially vulnerable to digital security risks. They become targets for fraud, hacking and theft and the requirement of conducting personal and/or sensitive activity from a remote location and across international borders. 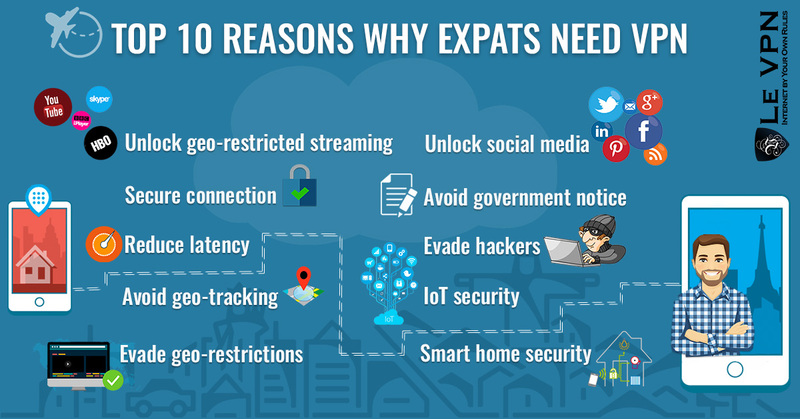 In the following article we’ll outline what an expat is, reasons for expatriation, security risks for expats, give an introduction into what a VPN is, what a VPN can do for you and where to find top rated expat VPN services for whole home and IoT security. Expat, Expatriate. At face value this is a word easy to define; a citizen of one country living abroad. Digging deeper into the subject may surprise you, the definition of what an expat truly is is more complicated. The very word brings up romantic images from the movies and literature; Humphrey Bogart in Casablanca, Hemingway and his passion for Cuba and the Caribbean and tales of adventure such as Stanley and Livingstone, and more sinister works such as Conrad’s Heart Of Darkness. In today’s usage the term is most often applied to skilled workers living abroad but the reasons for living abroad are myriad, the time frame indeterminate. In all cases one thing is common; a citizen of one country is residing in another. Confusion arises because there are other terms that may be used to describe a person of one nationality living in another country. Two of these are immigrant and migrant. Immigrants are different in that they have chosen to permanently reside in another country and may be seeking citizenship. Expatriates retain their citizenship but have chosen to live abroad, and that may or may not be permanent depending on the situation and how things play out. Migrants are different in that their movement through different countries is tied to seasonal or other factors, occurs with frequency and/or regularity. Expats may only move once, or twice when they move back to their home nation, at no time is periodic and continued movement implied. Nomadic is yet another term that could be used to describe an expat that isn’t quite right since nomads are constantly wandering from place to place with no permanence. In older days the term expatriate was also used to describe an exile, or someone who chose to renounce their nation or government. In more recent days people have been expatriated by their country, as when Nazi Germany renounced opponents living abroad such as Albert Einstein and others. The United States protects the right to expatriate with the Expatriation Act of 1868. It says that expatriation is a right inherent to the ideal of life, liberty and the pursuit of happiness. Believe it or not there is some controversy over the use and application of the term expat and all the others that could be used to describe a person or people living abroad. This is because the nuances in wealth, length of stay, motives for moving, nationality and even race are used to differentiate the expat from the immigrant, migrant and nomad. Basically, an expat is an individual from a more developed, wealthier nation who has chosen to live abroad, and more specifically in a country of lesser development. Business! – Business or work is the number one reason to expatriate. A business with operations abroad may choose to use expatriate workers for a number of reasons, same with a foreign business with operations at home, including but not limited to a better trained and qualified workforce. The scope of why and how a business, or an expatriate employee, may choose to use expat employees is so vast that it has been broken down into a number of sub categories. Short term assignments. Due to the high level of failed expatriation, unhappy families and other concerns more and more businesses are shifting to shorter term assignments. These may last a few months to a year, do not require a family to move and are generally project or problem-solving type assignments. Self Initiated Expatriation. This is very similar to the short term expatriate except for one thing. Self initiated expatriates are most often self-employed or freelance employees who seek out contracts for overseas work. They are an attractive source of skilled work for local and international businesses, usually have a lower compensation requirement and do not require a full family move. Outsourced Expatriate. This is the opposite of self-initiated-expatriation and a growing trend in emerging markets. Local businesses with needs ranging from short term projects to full time leadership positions are seeking qualified help abroad. Commuting Expatriate. These expatriates live permanently in one country but travel to another for work. This is usually done on a rotational basis of a few weeks on/a few weeks off that helps relieve stress within families while allowing businesses and employees to benefit. Commuter expatriates may work for one company with needs abroad or work for themselves. Flexpatriate. Flexpatriates are employees of one country, possibly self-employed, who are sent on short term assignments to foreign locations on a periodic basis. These jobs may be as short as a few weeks or as long as few months but are not permanent. Examples include negotiations, setting up new operations, special projects, inspections and many more. Education is another big reason for expatriation. Students from poorer nations, or those seeking specialized education, often expatriate themselves for school. The need for skilled and specialized workers is so great that many businesses promote and support educational opportunities on an international basis. Lifestyle is another big reason for expatriation. For some, the allure of living in an exotic locale is irresistible, the chance to start a new life with new friends and a new future. For others a visit to a foreign country while young is enough to plant a lifelong dream of retirement. Weather can also be a motivational factor when choosing to live abroad. Residents of colder climes may choose to live somewhere warm, or tropical, while another may choose to move where there is enough snow or glaciers for year round skiing. Taxes are a pressing reason for many people to expatriate. Some countries have onerous tax laws, France for example, that have forced a mass exodus of their more affluent citizenship. For the wealthy, in today’s globalized world, what does it matter if you live in one place over another if it can save you 10%, 20% or more on your taxes. Retirees are especially sensitive to taxes, they often lived on fixed incomes or limited means that can be maximized in a lower cost living environment. Persecution, political or religious, is another reason many of today’s expats have chosen to live abroad. While it may at first seem like this would qualify a person as a refugee there is a difference. A refugee usually has no choice but to leave, and the term is usually applied to people of poorer nations fleeing to a richer, stronger nation. Crime has become more of a reason to expatriate in recent years. Growing crime in some of the worlds largest and most crowded areas. If this is your reason for wanting to expatriate it is suggested that you do extensive homework before choosing a new country of residence. Thankfully the Internet has made that even easier than ever. Digitization, computers and the Internet have helped to increase expatriation in the same way as the early advance of industrialization, transportation and globalization. What many fail to take into account is that there are many risks when using the Internet and those go up exponentially when using the Internet from a remote location, third world country or if you are trying to remain inconspicuous. This is a list of a few of the things you may be at risk of. Unsecured connections. If you come from a well established 1st world country you are probably used to a relative amount of security when using the Internet. There is a certain amount of trust between you, the ISP’s and the government that allows society to work. Even so, those connections are not as secure as they could be, exposed as they are to whomever would like to monitor them and when considering a move to a foreign locale the risks of being monitored, loss of personal information, hacking and malware increases. If the country you are in is well known to censor, monitor or otherwise control the Internet you are basically asking them to look at whatever you are going, whenever you log on. Unreliable connections/infrastructure are another problem when considering a move abroad. The country you are moving too may be the most honest, trustworthy nation on the planet but may not have the infrastructure necessary to guarantee to reliable and safe connections. Leakage is a big problem no matter where you live or what your status is. Leakage is anytime your data or information is lost while being transmitted across the Internet. One example is when social media like Facebook, Twitter or YouTube access your phone/laptop/tablet in order to “server you better”. What they don’t tell when they ask to view your contacts, profile and other data “that may be required” is that the information is often shared across applications. Facebook for one is notorious for adding new apps to their platform and then sharing all the information they gather about you with them. Each time that happens there is one more server, one more database with you on it, one more chance to lose it. The number of unreported breaches grew 85% from 2014 to 2015, and by double digits again in 2016. Hacking is also a big problem when using the Internet, especially if you are rich foreign retiree or businessperson. Hackers may take advantage of known weakness in local networks to exploit individuals, misdirect them to cloned or fake websites, steal personal identifying information, bank accounts, business secrets or deploy malware into your system. Non-secure connections and weak infrastructure only make this problem worse. Symantec, in their 2016 Internet Security Report, said that the number of zero day vulnerabilities, those that have yet to be discovered or reported, grew 125% in 2015 alone. Geo-location is a serious concern for more than one reason. For the average person geo-location or geo-targeting means that you may not be able to freely watch streaming content across the Internet. Many popular websites such as the BBC, ABC and Netflix are only available in their home countries, or have limited libraries for those abroad. For some geo-location takes on a much more sinister meaning. It may allow hostile forces to back track your connection and access your devices or even pinpoint your physical location. IoT, the Internet of Things, is growing fast. It has been estimated that there will be more than 50 billion connected devices by 2020 and that the average person will have at least 6 of them. IoT is great when it streamlines operations, helps climate control your house or keeps track of your workouts but it is a very bad thing when those devices connect to their manufacturers websites, or any other, without your permission and across an non-secure, unreliable connection. The Solution Is VPN, But What Is It? connections between LAN/people, people/people, people/LAN across PUBLIC wires. This created a need for security that did not yet exist. The basic functioning of the Internet is to direct the flow traffic from one source to another. This is done using markers, IP addresses, that tell routers and servers where to send information. In a sense it is like the mail, when you make a connection you are sending information out to the world. Without a VPN that information is easily spotted, monitored, intercepted and stolen, your connections are traceable and your devices are at risk. Think about it like this; your computer is the house, the IP address is the address, the router is your mailbox, the ISP servers the post office. Just like with your house, your IP address is visible to anyone who walks up to view it. When you put mail in your box and raise the flag people know you are making a connection. When that connection leaves your house the address and return address are both visible to whomever may see it and the mail itself is easily intercepted and anyone with the addresses can track the mail back to you. The VPN works by masking the house so no one knows what you are doing, the mail is then sent through a digital tunnel that no one can see, and if they could it wouldn’t matter because the original envelop has been further masked by another, anonymous envelop. VPN stands for virtual private network. It is a system of protocols that ensures secure connections as if you were not on the public Internet but using a private, local network. The system usually works through a subscription service such as Le VPN which provides a number of specialized VPN servers located around the world. You download the software to your devices and then use it to connect to these servers, effectively bypassing your Internet service provider. All information, requests for connections etc that leave your devices are first encrypted so that they can not be read, and the re-packetized (put into a new digital envelop) in order to keep you, your location and your data safe from prying eyes. Mask IP address / Unlock geo-restricted streaming media. gives new address in choice country. When you connect with a VPN for foreign country your home IP address is encrypted and hidden from everyone except that server and the destination network. Anyone looking to find your IP address will be presented with the address of the server, or an address assigned to you by that server. This is how you avoid geo-restrictions. You log onto a VPN server in your home country, or the country with the TV shows you want to watch, and then access the websites as if you were living there. Secure connection, better connection across the VPN expat network rather than the local infrastructure. Using a VPN for home country ensures the same access as you are used to. Reduce latency. Latency is another word for slow connections, slow download speeds. The local network may be slower than what you are used to, or the connection between it and your home nation may not have the best infrastructure. Connecting with a VPN in the country in which you are located can help reduce that by providing a better, more secure and more reliable connection. Avoid geo-tracking. VPN’s help you avoid geo-tracking by 1) hiding your IP address and country of origin and 2) by making your connection virtually impossible to find. Avoid geo-targeting, evade geo-restrictions. Masking your IP address give the added benefit of avoiding geo-restrictions which may prevent you from watching your favorite shows. It also can be used to avoid issues when logging into sensitive networks. A website in your home nation such as your bank may red-flag a connection from the country you are living in. Avoid censors, unlock social media, Facebook, YouTube andTwitter. Avoid censors in the nation of residence with a secure, encrypted and masked connection in order to log into a VPN server in a nation that allows free use of Internet resources. Avoid government notice/intervention. Same as avoiding censors, log into a secure VPN server to bypass and avoid government notice. Avoid/evade and frustrate hackers, malware, data miners the works. Once again, the secure, encrypted connection is so hard to find, so hard to trace, so hard to crack that there are literally millions of easier targets than you with your VPN. IoT security is enhanced with VPN as well. Protect all your devices with the technology but there is one catch, not all devices support VPN or are even enabled with enough memory to store the software much less run it. But there is a solution for that too. VPN router for whole home security. You can download Le VPN to your home or office router, or buy one that is already enabled with VPN technology, and protect any and all devices that connect to the Internet automatically and without restrictions. I can’t say it any simpler than this. If you are an expat using the Internet in any form you need a VPN. VPN for expats is the only way, the best way, to ensure that risks are mitigated and you can watch all your favorite TV shows at the same time. The cost is low, less than $5 per month, so there really isn’t any excuse not to use one. Why wait, sign up for Le VPN and protect your home and family from boredom now, before it’s too late.